I usually stick to paperback Sword & Sorcery but was lured in by the Marvel reboot and the art. Read this on my iPhone, horizontally displayed. Worked pretty well. The story has all the elements one would expect, and they went for an epic overview with this first of six episodes. It covers Conan's birth on a battlefield to his apparent death (that's not a spoiler, that was a marketing strategy/blurb as well). A good dose of horror is presented in the new villain who haunts Conan throughout his life: The Crimson Witch (who serves an entity called Razazel and the "Great Red Doom"). I'm hooked. 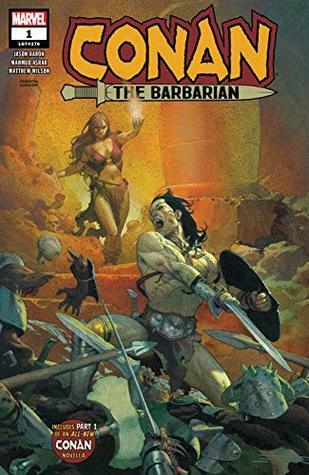 Trying to decide if I should get the second (Conan The Barbarian (2019-) #2 now... or just wait until July 2019 for the first 6 promised in paperback. Who am I kidding, I can't wait that long. I'll get the next one. The first of 12 installments of "Black Starlight" is included (dedicated to Conan comic veteran Roy Thomas .... written by John C. Hocking (author of the pastiche: Conan and the Emerald Lotus). It is a decent teaser, introducing the sorceress Zelandra touring with Conan via Stygia; their destination and goals are still unfolding, but this entry was only a few pages. In short, this issue has me excited about Conan again. Hoping the subsequent installments continue that.